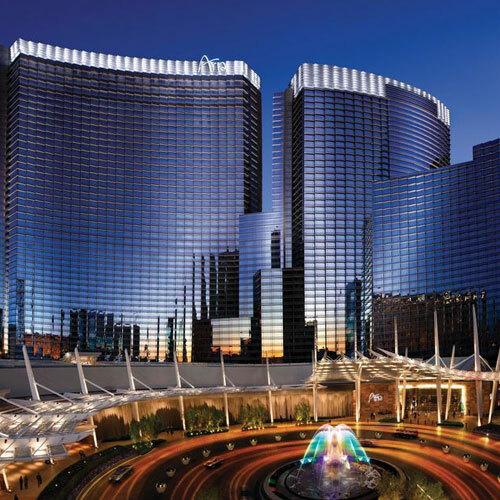 Members save 10% and earn MGM Resorts M life tier credits when booking AAA rates! This is my place for "rock star treatment," including complimentary limo rides to and from the airport, private lobby entrance and amazing suites. The pampering begins with a complimentary limo ride from the airport to a private drive where each guest is greeted by name. Feel free to enjoy complimentary refreshments in the lobby lounge. You can choose from varied-size suites all the way up to a two-story villa that comes standard with a butler. The suites are on the 25th floor and up, giving each room panoramic views of the bustling city of lights. 442 units, some two and three bedrooms. 34 stories, interior corridors. Accessibility (Call). Between Flamingo Rd and Tropicana Ave; on the Strip. 3730 Las Vegas Blvd S 89158. Station: CityCenter. 6 restaurants, also, ARIA Cafe, Bardot Brasserie, Blossom, Five50, Javier's Finest Foods of Mexico, Jean Georges Steakhouse, Julian Serrano, Lemongrass, Sage, see separate listings, full bar, nightclub, entertainment. refrigerators, pay movies, safes. Fee: high-speed Internet, wireless Internet. sauna, hot tub, steamroom, cabanas, health club, spa. valet laundry, boarding pass kiosk, rental car service, airport transportation, room service.